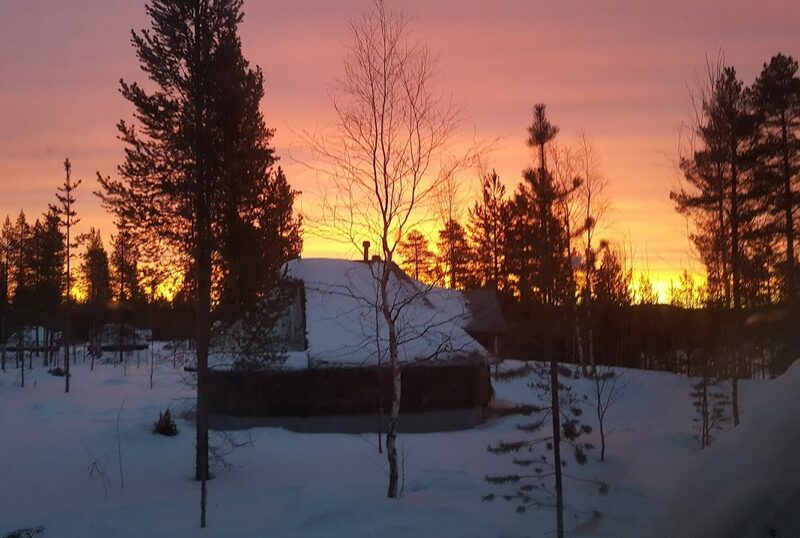 Northern Lights – If your dream adventure includes below zero temperatures, white snowy scenery and a wooden cabin with beautiful ceiling windows for nightly stargazing or northern light spotting, then we can highly recommend Aurora Village! 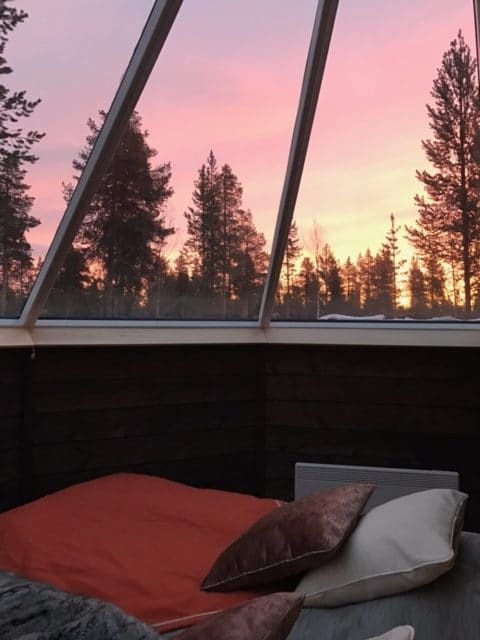 Featuring only 10 cabins, Aurora Village is one of the newest luxury experiences in the Finnish Lapland, in a town called Ivalo (airport code IVL). 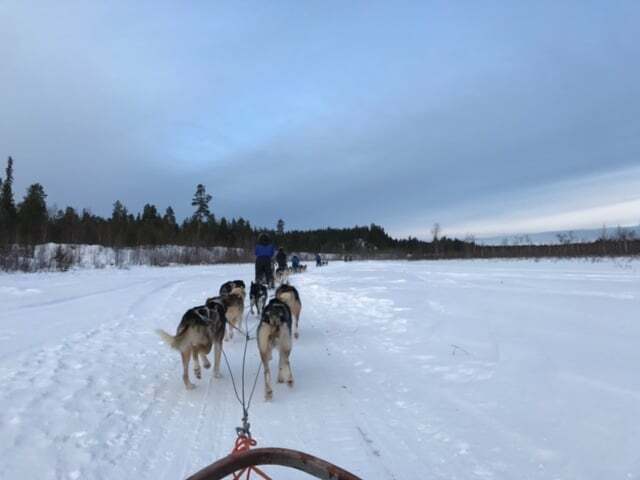 Located only about 13km from the airport (taxi cost about 30-40Eur each way) and 1,5km from Ivalo town, Aurora Village is close enough to make it convenient, but feels that you are totally in the middle of nowhere in the Finnish Lapland wilderness. The accommodation, Aurora Cabins, are beautiful and sit a good distance from each other offering plenty of privacy. The view from the ceiling windows is amazing! 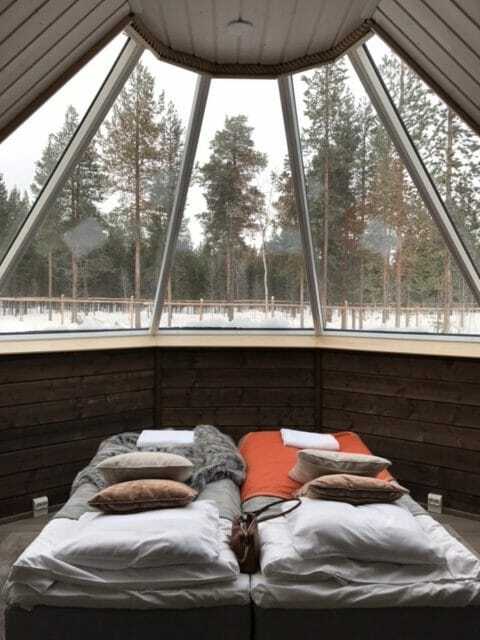 The windows are heated, so even if it snows, the view remains clear. The stunning ceiling windows are a real highlight of the cabins – but everything else is very well presented as well. The bed is comfortable and positioned right under the windows. There is a fridge to stock your own snacks, Nespresso machine and a walk-in shower (a wet room) with complimentary toiletries. It may be hard to leave the cabin as all you want to do is simply lie on the bed and stargaze through the ceiling windows, but there is a lot to do in the area. You can go on a husky or snow mobile safari, ice fishing or hunt the northern lights with an expert guide. Aurora Village has sledges and sliders for children and they also have snow shoes at the cabins, which are all complimentary. The activities are not included in the price, but are reasonably priced using own guides or reputable local companies. There are six friendly reindeers living at the properly and guests can feed them every morning at 10am after breakfast, which is served in the main cabin. 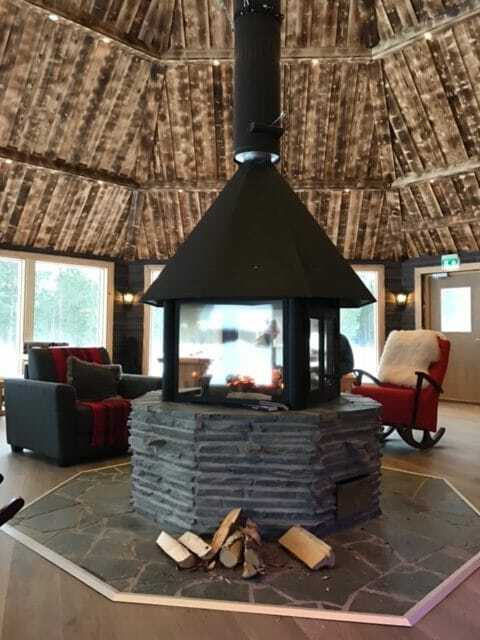 The newly built main building is a beautiful high-ceiling log cabin with an enormous fire place in the centre – and there is always tea, coffee and biscuits available (complimentary). The main cabin is a lovely centre point where guests can talk about the activities they have done and exchange experiences over a hot cup of coffee or tea. Naturally one of the main activities is spotting the northern lights. It can never be guaranteed, but it is very common to see them in the winter time. The guides happily let guests know if there is a sighting, so they can get their cameras ready. Although you can go on a northern lights ‘hunting’ safari, you can also see them at Aurora Village when the sky is clear (there is an app that the guides use so they know when it’s the maximum chance of spotting them). Aurora Village closes for summer, but winter 2017-2018 is already available to book.